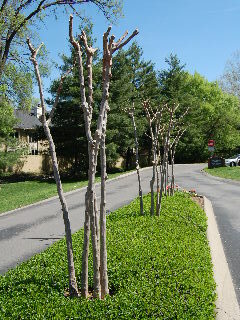 Here’s a visual example of severe pruning of crape myrtle and of the profusion of growth that ensues the following spring and summer. We have mentioned in an accompanying article in the “Plants” section of this website that you, the gardener, can choose the form you want your crape myrtle to assume. It can be grown as either a low-growing controlled shrub or as a free-flowing tree-like plant that reaches heights in excess of 25 feet. 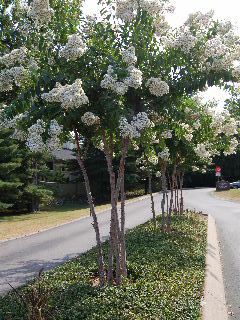 If you choose to sculpt your crape myrtle into a shrub, yearly pruning and shaping is required. And remember to do this pruning in the dormant season so as not to cut off the new growth that produces the spring and summer blooms. If you decide to allow unrestricted upward and outward growth of your crape myrtle—thus allowing it to assume the status of a small tree—then you need only to cut out the lower-growing side branches. This allows for a great visual showing of the scaling cinnamon-colored bark of the main stems. Also, removal of “sucker shoots” from the base is necessary in order to allow clean growth and unobstructed viewing of the attractive bark. Depending on how big your crape myrtle is when you start sculpting it, you may be able to use just a small tree pruning saw for the needed surgery. Or, if the plant has gotten larger and the stems are quite thick, a bow saw or possibly even a small chain saw may be necessary. See our article Do You Really Need A Chain Saw? The point is—don’t be afraid to cut. The crape myrtle is quite a resilient and hardy grower. In fact, even if the plant has been in place for several years during which time no pruning has occurred, you still can do severe pruning to remove much of the top-growth if you decide you want to convert your tree to a shrub.